People have been known to squawk with delight over Anna Olson's creative and delicious baking treat! 1. Preheat the oven to 300 F. Trace 6 circles, each 2 ½-inches across and with at least 2 inches between them using marker on parchment paper, then flip the paper over onto a baking tray. 2. Whip the egg whites and cream of tartar first on low speed, then once the whites are foamy increase the speed and slowly pour in the sugar while whipping. Continue to whip until the whites on high speed until they hold a stiff peak when beaters are lifted. 3. Fill a piping bag fitted with a large star tip with the meringue and pipe circles within the lines drawn on the parchment, completely filling the circles. Pipe a ring or meringue on top of the outside edge, creating the “nest” effect, spiraling up to about 2-inches above the base. 4. Place the meringues into the oven and immediately reduce the temperature to 275 F. Bake the meringues for 45 to 65 minutes (this timing will be impacted by the outdoor temperature and humidity, making the meringues take longer if it is humid or warm out). If you find that the meringues are starting to brown, crack open the oven door and continue to bake. Cool the meringues completely to room temperature on the baking tray, then gently lift to store in an airtight container until ready to serve. 5. For assembly, whip the cream to soft peaks and stir in the sugar and vanilla. Place a birds’ nest onto each plate, dollop the cream into the centre of the nest and top with berries. Serve immediately. 6. 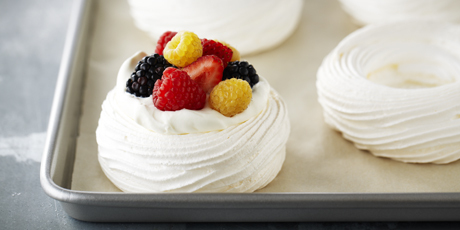 The meringues can be baked up to a day in advance, but they should be assembled immediately before serving.